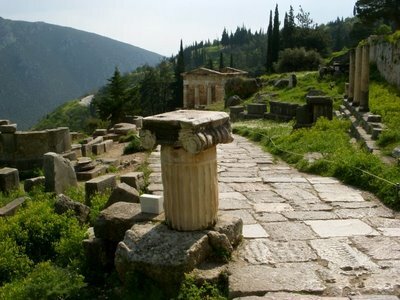 Delphi dates from the Mycenaean age between 14th and the 11th centuries BCE. During this time, the deity that was worshipped was Ge “Earth”. Around the end of the ninth century, the cult of Apollo became established. 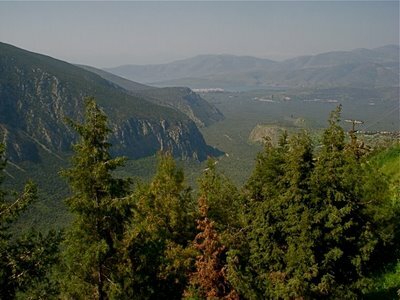 Delphi was considered the naval of the earth and the Center of the Universe. 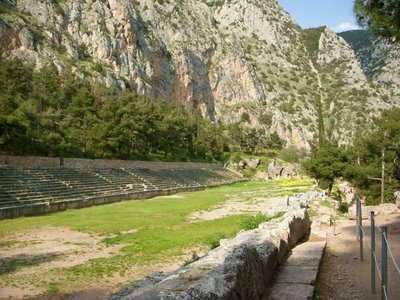 The Temple of Apollo became firmly established after Apollo killed Python the snake that guarded the oracle of Ge. 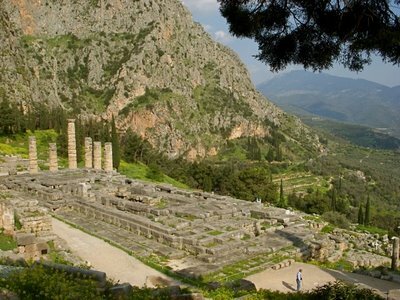 From the time of sixth and four centuries, Delphi and the Temple of Apollo flourished with fame. 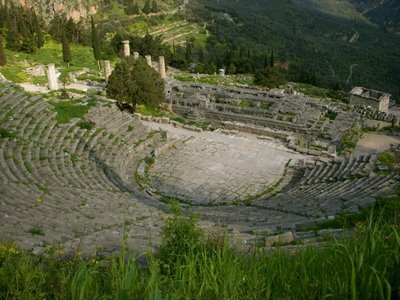 People traveled for throughout the ancient world to hear the Oracle and receive advice. The Temple survived until Theodosius abolished the temple activities and dismantled the temple in the 4th century CE. 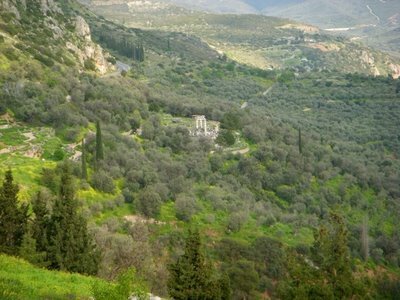 Delphi is truly beautiful, and the location of the Temple that is situated on a cliff is outstanding. However, the location does not interest me, it is the characteristics of Apollo that are interesting. Written in stone at Delphi the say goes: All things in Moderation, and—Know thy self, two sayings that are of basic wisdom to living an amiable life. Apollo is said to be the god of music, prophecies, poetry, archery, and said to be the god of light and truth. Apollo is associated with the sun, also adverted to as the most beautiful of the gods. He is Artemis’s twin brother, and son of Zeus. His symbols are the bow, lyre, and laurel. Medicine and healing were associated with Apollo, whether through the god himself or mediated through his son Asclepius. Apollo was also seen as a god who could bring ill health and deadly plague as well as one who had the ability to cure. In contrast, Ares is the god of war, murder, and bloodshed. Brother to Athena, and is the son of Zeus. Ares has affairs with Aphrodite. His symbols are vultures, dogs, boars, and a spear. Ares correlates with Baal of the Canaanites whom Judaism worships, the offshoot of the failed Israelites. All the world religions worship Baal, and Ishtar who correlates with Aphrodite. From studying the gods of Greece, one cannot help to think that Apollo is one of the good guys. Light and truth are always associated with Apollo. Previous post: One more night—Athens.